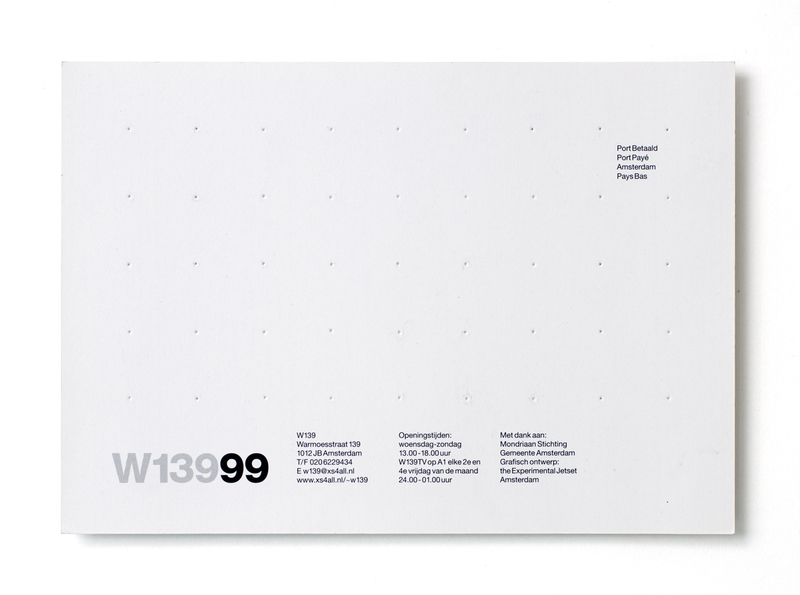 W139 is an independent exhibition space, founded in 1979, and situated at Warmoesstraat 139 (hence the name, W139). Firmly rooted in the city’s squatter subculture, it’s currently one of the main artist-run spaces in Amsterdam. 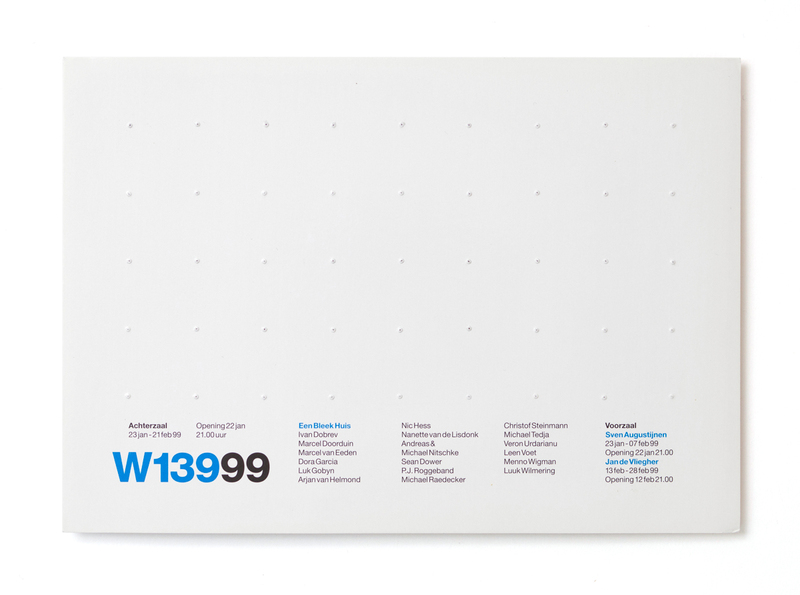 Each year, they commission a different designer or studio to design their invitation cards for that particular year – and so, in 1999, we were asked by Jean Bernard Koeman (then director of W139) to create the invitations for that year. Thinking about a way to keep all the cards together as a series, we thought it would be an interesting concept to take the most archetypical idea of an exhibition space (basically, the notion of the ‘white cube’ as an empty, three-dimensional grid), and to project this idea onto the cards in the most literal way – in other words, to transform the invitation card itself into a 3D-grid. And we figured that the most direct way to turn a piece of cardboard into a spatial structure would be to perforate the card with a grid of little holes. This grid of tiny holes could then be used as a sort of platform, or framework, in which we could situate the themes of the exhibitions. In other words, for every exhibition, we tried to come up with a way to use the grid in a slightly different way. So in general, the idea for each card was to find a way to combine the given theme (or title) of the exhibition with the grid of pinholes. For example, for the exhibition ‘Youthquake’, we turned the grid into a Richter-like seismograph, for ‘Doel Zonder Oorzaak’ (on the theme of networks), the grid was turned into an infrastructure, for ‘The Global 500 and Other Stories’ (an exhibition of video-based art), the grid was used as a sort of indication of time, and for ‘Faling/Failure’, the card was turned into a skin-coloured grid of little bleeding wounds. Level Zero Cinema, opening March 5th, 1999. 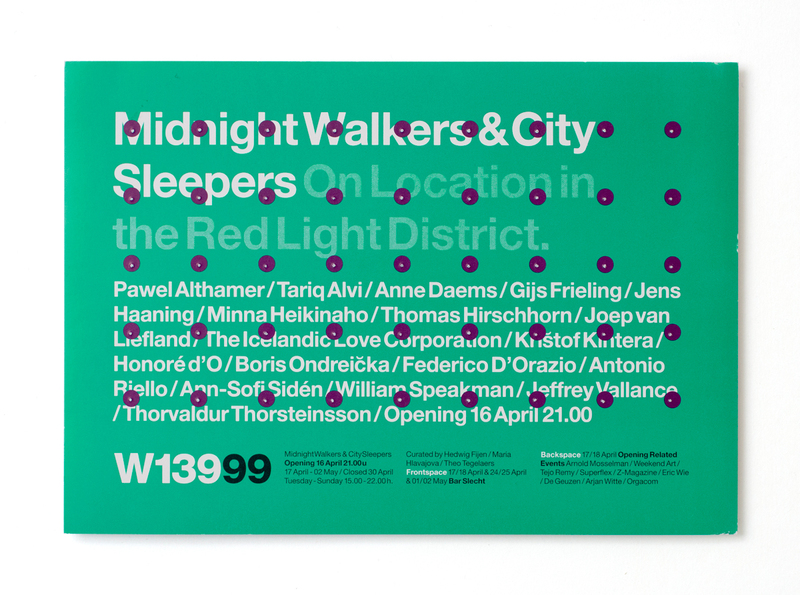 Midnight Walkers & City Sleepers, opening April 16th, 1999. 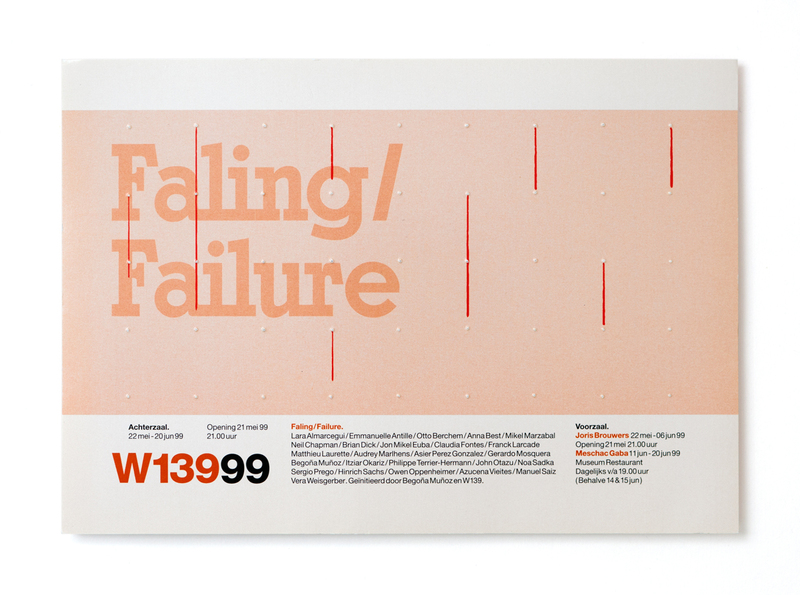 Faling/Failure, opening May 21st, 1999. 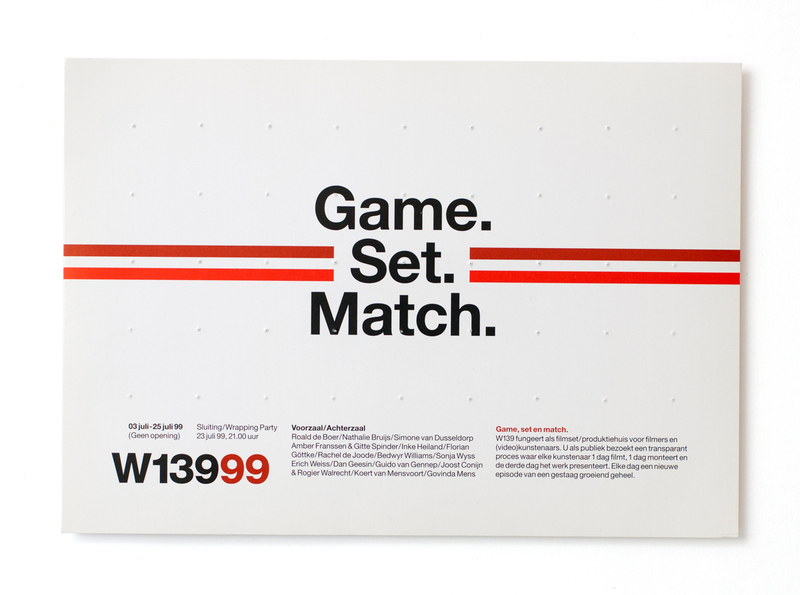 Game, Set and Match, closing reception July 23rd, 1999. 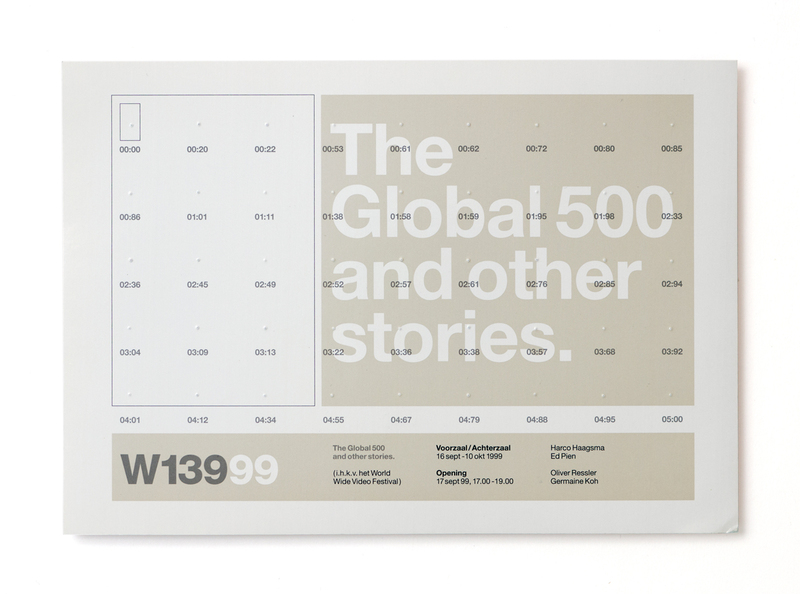 The Global 500 and Other Stories, opening September 17th, 1999. Youthquake, opening October 22nd, 1999. Doel Zonder Oorzaak, opening December 10th, 1999. Looking back on this particular series of invitation cards, we realize they clearly fall within a larger ‘sub-genre’ within our ‘body of work’ as a whole – namely, that of perforated printed matter. From the Paradiso / Program we designed in 1996 (and Paradiso Poster/Folder in 2010) to the Paradiso / Bassline 1 we created in 1997, and from the Anarchitecture catalogue we designed in 1999 to the NAiM Jean Prouvé we created in 2007 – all throughout our practice, we have always tried to explore the gesture of perforating printed matter. In brief, we believe that a lot of our work revolves around the theme of showing graphic matter as just that: as matter. By folding, cutting or perforating (just to mention three techniques), we try to reveal the construction behind graphic design, emphasizing the idea of the designed object as essentially a human-made construction – as something that is created by humans, and thus can also be changed by humans. The above cards were produced in 1999. 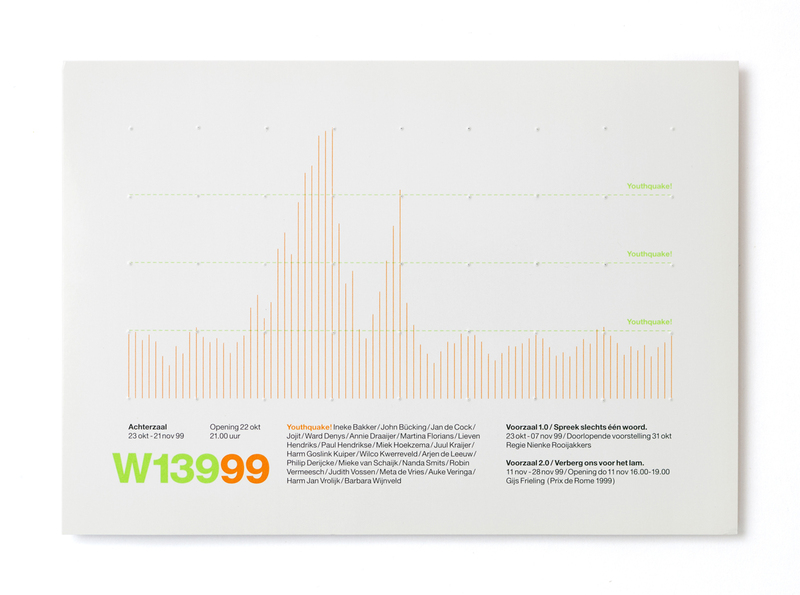 In 2002, we worked for W139 (and for Jean Bernard Koeman) again, when we designed Wij Bouwen Nieuwe Zinnen (‘We Build New Sentences’), a ‘quadrennial’ publication cataloguing the activities of W139 between 1999 and 2002. In 2006, we worked with JBK again, when we designed the publication Monument for him. 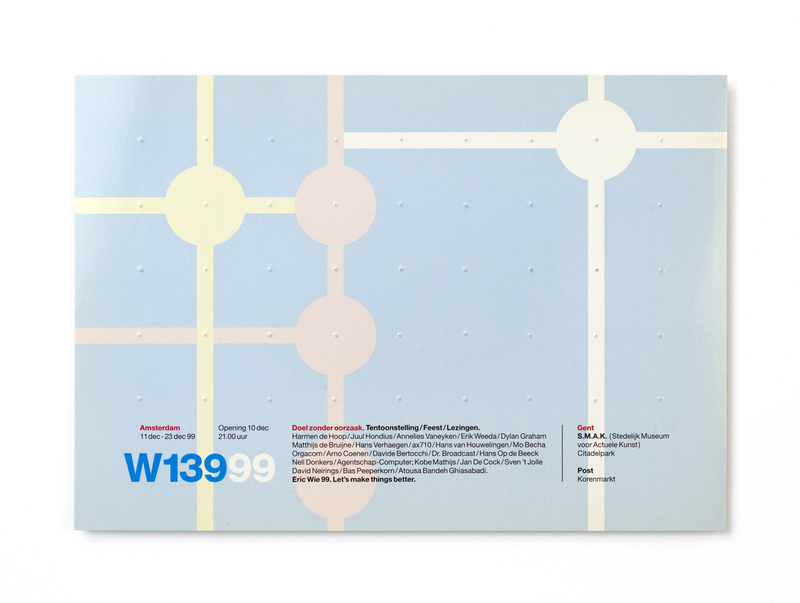 In 2009, we were part of a group of designers and artists who were commissioned to design posters on the occasion of W139’s 30th anniversary. 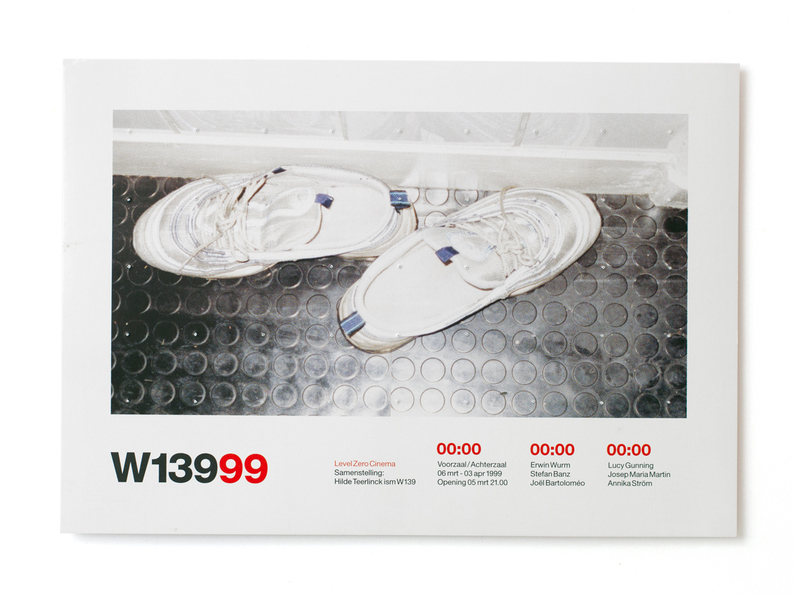 And in 2011, W139 was the space in which we created the first edition of Two or Three Things 1. All the above cards were printed by Drukkerij Atlantic (at that time still located at the Warmoesstraat, but currently situated at the Prinsengracht), who also took care of the perforating. We like to thank Jean Bernard Koeman, Bernie Deekens, and the rest of the staff at W139.